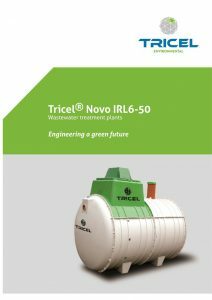 Bluestream’s Tri-cel Wastewater Treatment Systems are manufactured using a GRP sheet moulded plastic construction technique which is at the cutting edge of technology. Manufactured in Kilarney, Co Kerry, our systems are the market leaders in Biological Aeration Filtration systems providing you with simplicity of design and functionality, allowing for the most cost effective, easily maintainable systems available on the market. 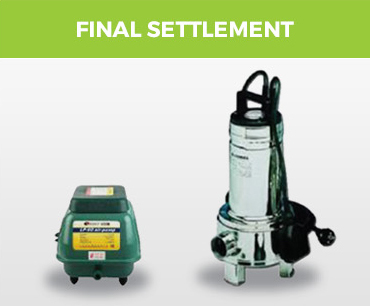 With correct use and maintenance we guarantee a lifetime of reliable service. 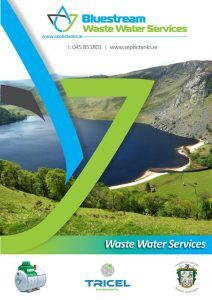 We supply a large range of septic tanks, waste water treatment systems and percolation solutions all guaranteed to be the highest standard using Irish manufactured products. 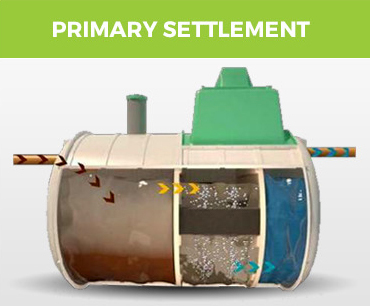 Primary settlement takes place in the primary settlement chamber where the waste water is introduced. The solids drop to the bottom and are separated from the liquid. Anaerobic breakdown now begins to occur and improves the Water quality. 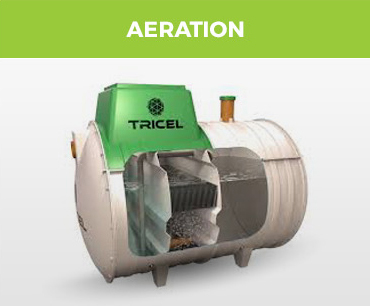 Biological treatment takes place in the aeration chamber where masses of naturally occurring bacteria inhabit specially designed growing media. These bacteria are sustained by air, which is continuously supplied from a purpose built pump housed in the top section of the unit. The treated liquid now flows into the third chamber where final settlement of sludge occurs. This sludge is continuously returned to the primary chamber by a sludge return line and treated liquid is now safely discharged to the percolation area. Underground installation causes minimal visual impact. Good to deal with a company that does exactly what it should and a pleasure to do business with. Many thanks and re I recently engaged Jim Phibbs in connection with my septic tank. I found Jim , Cathal and Aidan to be very professional and competent in their dealings. I would have no hesitation in recommending them. Very prompt response on a Sunday, Work carried out on Monday, Mark the operator was very helpful and went the extra mile to ensure all drains were cleared. Competitive price & great service. Will use as my future septic tank service company. Mark was very pleasant and professional in his approach and his attention to detail gave me confidence that the job was done right. I was 100% happy with the service and would recommend it to others.